Designed by Country Artists in the U.K., under the famous Sherratt & Simpson brand. Sherratt & Simpson are renowned for producing a range of dogs and puppies all sculpted with the same care and attention to detail that epitomises everything they create. 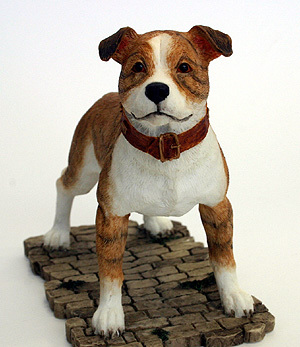 Handcrafted and painted this handsome Brindle and White Staffie that is a great gift for the SBT owner. He is 10cm high and 12cm long and would be loved by any Staffordshire Bull Terrier owner or admirer.